Using the warp (in version CS3 and above) and puppet warp (in version CS5) tools in Photoshop (PS) is a fast and easy way to change and distort the appearance of motifs. What is useful with this technique is that you need to paint only icons for a motif such as a flower + leaf + stem, duplicate them numerous times, and distort them by applying the warp tool to the icons. This is a simple and fast method in creating different looking motifs to add variety to patterns and backgrounds. 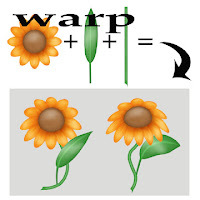 Note: In this tutorial, the warp tool will be used separately on the flower, leaf, and stem for better results. After the distortion is finished, they can be assembled into finished flower motifs. Either create a flower and leaf in PS or scan a painted one and place on a layer in PS. Hint: Read "Photoshop Tip: Easy to Create Motifs for Art Collections" to learn a great technique in creating different looking flowers from one flower petal. The flower blossom example at the left was created with this technique. 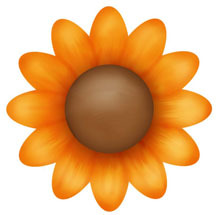 A brown center was added and the flower was shaded with a combination of the dodge and/or burn tools and the drop shadow, inner shadow, and inner glow located in Layer / Layer Style option window. 1. Select the flower motif by using the Command + letter T keys on the keyboard. Then select the Warp tool in the Edit / Transform window. A nine box grid appears over the image. 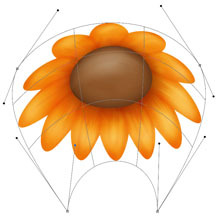 Use the cursor to move the grid lines and the corner-control-point-handles (CCPH) on the four corners of the grid to distort the flower. 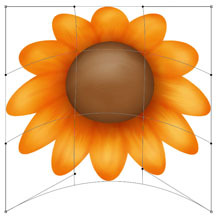 The example at the left illustrates how the flower was distorted by moving the grid lines and the two bottom CCPH up. Press the Enter key when you are finished transforming the image. The example at the left illustrates how the flower is distorted even more by moving the grid lines up, pulling the top two CCPH down, and pushing the bottom left and right CCPH upward and inward . 2. The top leaf in the illustration at the left is the original painted leaf. 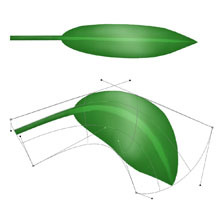 The bottom illustration shows how the leaf is distorted with the warp tool by moving the grid lines and the top and bottom CCPH upward. 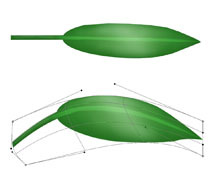 The example at the left illustrates how much the shape of the leaf can be distorted by moving the grid lines and CCPH. 3. 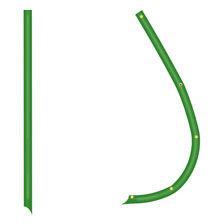 The warp tool does not do a good job in bending a straight line such as a flower stem. 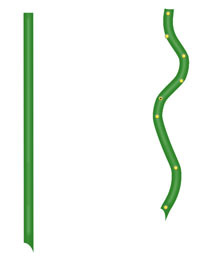 You can either paint the stem or use the puppet warp tool (if you own Photoshop version CS5). The illustration at the left shows the original painted stem and one (on the right) with yellow pins that I placed by clicking on the stem while in the puppet warp tool (Edit / Puppet Warp). Click on a pin and hold down the mouse while moving it to change the position of the stem. Press the Enter key when finished. The illustration at the left shows another distortion of the stem. 4. Once the flower blossom, leaf, and stem has been warped, assemble it into a flower motif and merge the layers onto one layer. The flower can then be used with other flowers that have been warped and other motifs for backgrounds and patterns in your art collections. Have fun! Another great, informative post! Thanks.